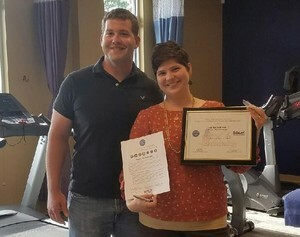 FRANKLIN, TN--(Marketwired - Jun 8, 2016) - Martha Kartaoui, a district patient support leader for Results Physiotherapy, received the Patriot Award on May 18 in Cary, North Carolina, for her support of team member and North Carolina National Guardsman Sgt. Jacob Lease. Lease nominated Kartaoui for the award, which recognizes individual supervisors for supporting employees serving their country in the National Guard. "My supervisor Martha has been extraordinary from the day I started at this company," said Lease in his nomination submission. "Never hesitating to give me time off for drill dates and training as well as providing someone to cover for me and assisting my wife during those times. She has recognized me at multiple company functions, noting how proud she is of my upcoming deployment. She is the embodiment of this award and more." Established in 1972 by Department of Defense office Employer Support of the Guard and Reserve (www.ESGR.mil), the Patriot Award reflects efforts made to support Citizen Warriors through a wide range of measures including flexible schedules, time off prior to and after deployment, caring for families and granting leaves of absence as needed. A network of more than 4,500 volunteers across the U.S. support ESGR. "I'm incredibly proud of Martha and Jacob," said Tony Ueber, president and CEO of Results Physiotherapy. "Our mission and values are based on service to our patients so they can live without pain, and supporting a team member like Jacob so he can serve his country is not only consistent with our values, it's an inspiration for us all." "I'm honored and humbled to receive this award," said Kartaoui. "Jacob is a great team member and his willingness to serve with the North Carolina National Guard is a reflection of his kind personality. Results' leadership was always 100 percent supportive of my efforts to help Jacob in any way possible and I wanted him to feel that support in my words and actions." Sgt. Lease, now deployed and serving in the Middle East, said he looks forward to returning to Results Physiotherapy upon the completion of a safe tour. Headquartered in Franklin, Tennessee, Results Physiotherapy is one of the largest and fastest growing physical therapy companies in the U.S., operating a network of over 100 clinics in nine states. Recognized for its innovative hands-on approach, which yields faster pain relief and longer lasting recovery, Results Physiotherapy achieves greater than 20 percent better outcomes for its patients, as measured by independent data sources. The company's licensed therapists are trained in the newest, evidence-based techniques from around the world, and consistently rank in the top 10 percent of therapists nationally for quality outcomes. Learn more about the Results difference at www.resultsphysiotherapy.com or contact Mark Tinsey at mark.tinsey@resultsphysiotherapy.com or 615-218-2867. Follow us on Facebook at www.facebook.com/resultsphysiotherapy. Employer Support of the Guard and Reserve was established in 1972 to develop and maintain employer support for Guard and Reserve service. ESGR advocates relevant initiatives, recognizes outstanding support, increase awareness of applicable laws and resolves conflict between service members and employers. More information regarding ESGR Outreach Programs, or ESGR volunteer opportunities is available at www.ESGR.mil or by calling Darrell Johnson at 704-279-2801 or email luther.d.johnson.ctr@mail.mil. Jacob Lease and Martha Kartaoui with her Patriot Award, at the Results Physiotherapy clinic in Cary, NC.